Above Ground Pool Fences - Economical, yet strong; holds 400 pounds. What does this mean to you? This is a great way to safely enter and exit your above ground swimming pool and is designed to take up minimal space. 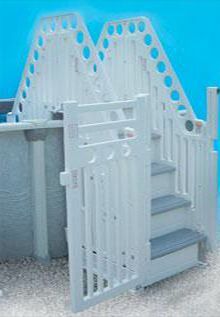 The included self-latching gate provides restricted access to your pool for added safety. The unique design of the pool entry system forms a complete entry/exit system into the pool. Exterior step treads measure 7.5" x 20"
In-pool portion contains five treads measuring 4.75" x 18"
The stairs can be cleaned in most cases using a hose for a quick spray down. Harder dirt can be removed with a sponge and soapy water. You may purchase an optional in-pool light. The 12 volt light is packaged and sold separately. It includes interchangeable colored lenses, a 10ft cable and UL listed transformer. We are the above ground pool fencesafety experts and we back that up with 7 day/week installation support. This cannot be found with any other competitor or the manufacturers, only AboveGroundPoolSafety.com makes the dedication to be available when you are doing your installation. We also have a variety of accessories for above ground pool fences that enhance different products like safety steps to add to your fence, enhanced magna latch system to add to your gates and more.